Take a walk with Gigwalk and you could earn some quick cash. Or if you are a business, you might want to add Gigwalk to your social media repertoire. Gigwalk is a new service that launched last month and its mission is to turn the world’s iPhones into “an instant mobile workforce.” Essentially, Gigwalk is a way for companies to have small projects completed by a mobile community workforce and for individuals to earn money by performing specific tasks using their iPhones. Gigwalk founded by ex-Yahoo employees — Ariel Seidman (former director of mobile search for Yahoo), Matt Crampton and David Watanabe. How do I get started with Gigwalk? What is the Gigwalk user experience? What are the the social media implications of Gigwalk? What is the Gigwalk user experience? In order to understand the social media ramifications of Gigwalk, I became a Gigwalker 2 weeks ago and have completed 17 gigs so far earning me a whopping $21 (with some $50 still pending). Gigwalk reminds me of my childhood when I searched for bottles and returned them for the deposit so I could get the 25 cents to buy a candy bar or pop. While I’m not going to get rich using Gigwalk, I have earned enough to take the family out to dinner (once). So far, the only Gigs I have done are to verify and take pictures of local businesses for Bing Maps. Using the Gigwalk map, I select a gig and start working. Then I have to answer a couple of questions and take some photos of the business. The hardest part is that the Bing Map gigs require you to upload a panorama photo of the interior of the business using the Photosynth application. And for about 5 minutes of work, I will get $5 (via Paypal) when my gig is approved (within 7 days). For business that are closed, Gigwalk only pays $2 but the work involved to verify a closed business takes just a minute or two. As far as the experience of completing the gigs, everything has gone smoothly with the exception of one gig where the owner did not want me to take any pictures and threatened to call the police (so I quickly retreated). I usually tell the manager or person working the front counter that I am taking pictures for Bing Maps. 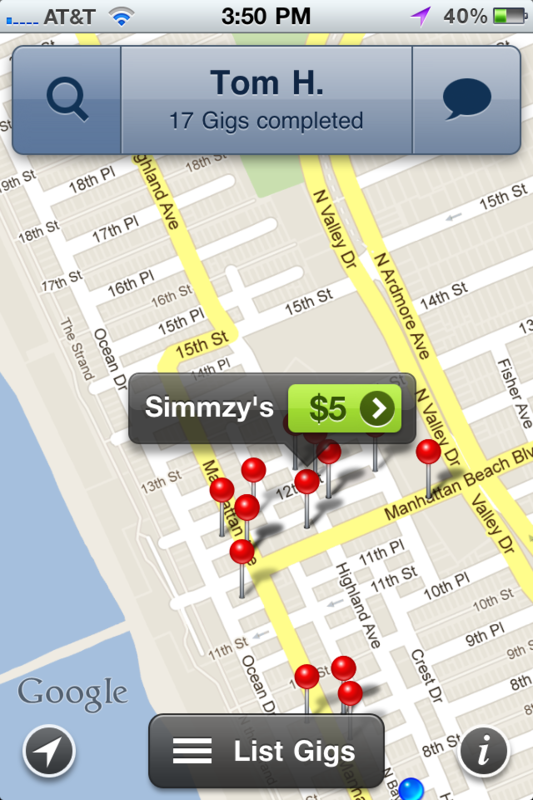 Overall, the Gigwalk iPhone app is solid, well-designed and easy-to-use. An Android version of the app is in the works according to the website, but no timeframe has been offered. How do I get started with Gigwalk? Individuals with an iPhone can download the Gigwalk iPhone application and get to work immediately by firing up the application and looking for nearby gigs. When you select a gig, you then have to click on the Start Working button to see the detailed tasks. A user can working on only one gig at a time. After you complete the gig, there is a submit button and you can also share the gig on Twitter or Facebook. Once a gig is completed, the business will review the results of the gig and pay you within 7 days via Paypal. Where is Gigwalk? Gigwalk has only rolled out to selected locales specifically, the metropolitan areas of Los Angeles, New York, San Francisco, Chicago, Boston, Philadelphia, Seattle and South Florida. As of today, California leads the nation with 23,171 available gigs followed by New York with 13,611, Illinois with 7,956 and Pennsylvania with 4,938. At an average of $5 per gig and more than 60,000 gigs listed, there is more than $300,000 available to be collected by Gigwalkers. Gigwalk is targeted at students, people looking for a second income, people who want to augment their income, people who want to explore their own or different neighborhoods, and people looking to be on the cutting edge of technology. What are the the social media implications of Gigwalk? The Gigwalk website identifies how companies can engage with Gigwalk to set up their own gigs and provides examples of possible gigs. Gigwalk is targeted at students, people looking for a second income, people who want to augment their income, people who want to explore their own or different neighborhoods, and people looking to be on the cutting edge of technology. Mapping – verify roads and signs, create and maintain maps, etc. 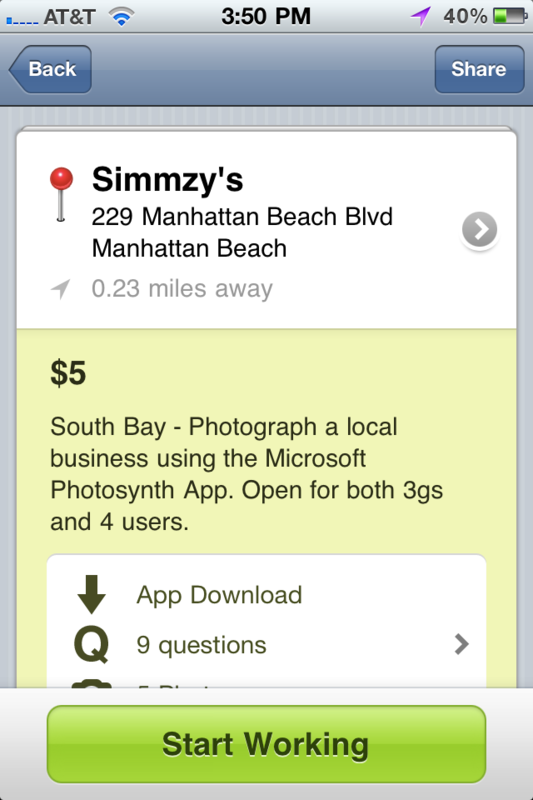 Local – get local business photos or videos, verify local prices, etc. Shopping – experience your product, visit your business, report on customer service, etc. Tasks can include taking photos or videos, answering questions involving yes/no, multiple choice or free text. For more information on companies who want to get started with Gigwalk, check out the How Gigwalk Works section of their website. The Gigwalk website provides a glimpse what a business would see for the reporting and output for completed gigs – but I would be interested in seeing more of these capabilities. Gigwalk has two levels of service for businesses – Basic and Pro. The Basic version provides you with photo-only gigs while Pro lets you get access to all of the Gigwalk features. Unfortunately, they do not display any pricing on their website and I have not signed up for a business account yet so I cannot comment on the pricing. I am definitely anxious to experiment with their business side of the service and hope to get an interesting project to test it. In the meantime, I will have to settle for the couple of bucks I can earn by picking up some miscellaneous gigs.